One of the perks of being a food blogger is that I get the opportunity to receive review copies of new cookbooks. There are a lot of them; however, only a very select few earn spots on my small kitchen shelf. Over the next few weeks, I’ll be sharing recipes from the new books that really are something special. The first cookbook is from my teacher and mentor, Meghan Telpner. You may know her from her first book, UnDiet, or her popular Academy of Culinary Nutrition (where I received my certification!). I’ve had the privilege of knowing Meghan for the last year and a half and let me tell you—she is the real deal and every bit as knowledgeable and bubbly as you’d imagine. Girl’s also got integrity in spades. To give you an example: shortly after I launched my SEO for Food Bloggers eBook, I submitted it for sale on her ACN website. Meghan emailed to tell me she loved it so much she wanted to buy her own copy through Pickles & Honey to use for her site re-design, despite already having a review copy. That’s the type of person she is. It was Meghan’s UnDiet lifestyle book that prompted me to become a Certified Culinary Nutritionist, and this latest UnDiet Cookbook is the natural successor to UnDiet. 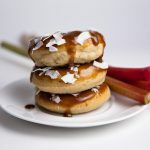 What I love about the recipes is that not only are they wholesome and delicious, but they’re also extremely simple. If you’ve ever thought, “I want to eat better/vegan/gluten-free/etc, but I don’t have the time”, this is the cookbook for you. The recipes are the opposite of fussy and whether you’re soy-free or grain-free, there’s something for everyone. Naturally, I gravitated towards dessert! This key lime pie is right up my alley: 10 ingredients, no-bake, and sweetened with dates and pure maple syrup. I’m a sucker for tart, citrusy desserts and this one hits the spot. I hope you’ll give it a try! 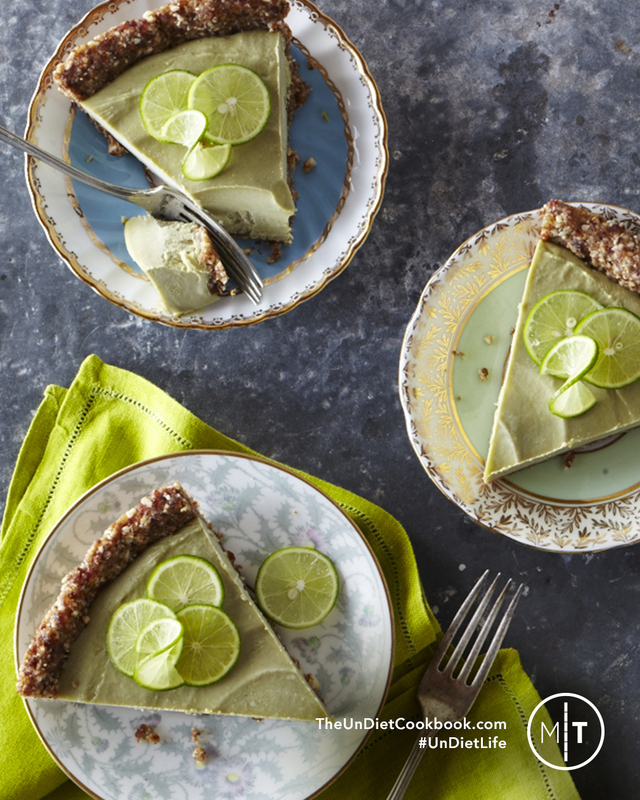 This raw and vegan key lime pie requires only 10 ingredients and 25 minutes of prep work. It's made entirely of whole foods and unrefined, natural sugars too! 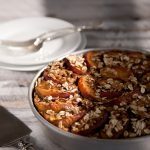 Excerpted from The UnDiet Cookbook: 130 Gluten-Free Recipes for a Healthy and Awesome Life by Meghan Telpner. Copyright © 2015 Meghan Telpner. Photography Copyright © 2015 Maya Visnyei and Catherine Farquharson. Published by Appetite by Random House, a division of Random House of Canada Ltd., a Penguin Random House Company. Reproduced by arrangement with the Publisher. All rights reserved. P.S. If you’re interested in the Academy of Culinary Nutrition, I wrote a review here. You can also contact me with specific questions. I’m happy to share my experience and really feel like it was a game-changer for me. 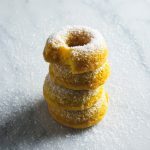 Filed Under: Cupcakes & Cakes, Other Desserts COPYRIGHT © 2019 Amanda Maguire. All Rights Reserved. I have never heard of the UnDiet cookbook! But anything that gets people to stop counting calories and instead just enjoying wholesome, healthy foods is good in my books. This raw key lime pie looks delicious – the perfect combination of creamy and zesty! I think you’re going to love The UnDiet Cookbook (and anything from Meghan Telpner, really). She is infectiously positive and has such a great outlook on food and life. Definitely no calorie counting! I loved the cookbook (it is one of the best perks 😉 ) She is such a awesome woman all around! Totally agree, Rebecca. Meghan’s a rock star! I’ve never tried Key Lime Pie in my life but now I want to! Do you need to soak the cashews first? Your recipe turned our marvelously even after halving the recipe. This is my first time trying a raw pie. Hi! Looks delicious, just wondering do you need to soak the cashews? Hi Mia! You don’t need to soak the cashews. That said, if you’re not using a high-speed blender, I would probably soak them overnight to make blending easier. These are amazing.I soaked my cashews for just an hour in lukewarm water and used my nutribullet. took only about a minute of blending and the filling was smooth as (vegan) cream. Huge hit. People couldn’t believe these were vegan AND raw.